St Oswald's Church, through the Church Mission Society (CMS), supports Kate and Tim Lee and their children Rebekah, James and Grace. 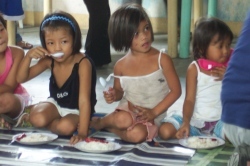 The Lees lived in the Philippines from 2003 until 2009. They started kids' clubs, in four squatter and slum areas, for street kids and children of very poor families. 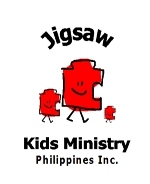 This has become Jigsaw Kids Ministries - a registered charity in UK and the Philippines. 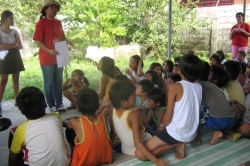 A team of local people have been trained as children's workers, acquiring skills to lead club activities, which include time to play with toys, games, singing, Bible stories, puppetry, homework clubs, serving nutritious meals, literacy and more. School sponsorship has given some children a chance of an education; two of the kids workers have had university sponsorship to study for a social work degree (one has graduated and is leading social outreach through Jigsaw); families can get financial aid for medical needs; children have been rescued from abusive and dangerous situations and taken to safe places. The purpose is to surround the children with the love of Jesus, to give hope in the hopelessness of dreadful poverty and to give the children opportunities they would never otherwise have. 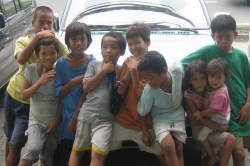 The Lee family have now returned to this country and, in a visit to St Oswald's in November 2009, explained that they had become convinced that the only way Jigsaw would be able to develop as a truly Filipino project, with the staff there taking decisions and initiatives, would be for the Lees to take a back seat. 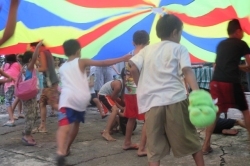 Jigsaw is now headed up in the Philippines by Lendehl Sallideo, who is ordained in the Episcopal ( Anglican) Church of the Philippines and who is a Church Mission Society "Timothy" mission partner. 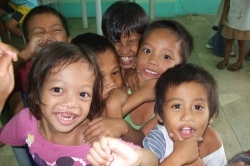 Lendehl works in hands on ministry alongside the Jigsaw team and is also on the Jigsaw Board in the Philippines. In October 2013 Jigsaw celebrated its 10th anniversary. Cecily Rands and Diana Wild from St Oswald's flew out to share in the celebrations in all four Jigsaw areas - Batasan, Area 4 and Vasayas with Forestry, all in Manila and their outreach in Angeles, a city to the north. The children enjoyed days of fun sports, grouped into teams named Faith, Hope, Love and Grace. There was special food and teams were awarded medals. A big gathering for celebration in Area 4 church saw different groups put on presentation of dance, singing, sketches and plays. A special joy was to see former Jigsaw Kids, now in their upper tens and twenties, come back to share in the celebration and speak about how Jigsaw had been significant in their lives. As a church we continue to support the Lees and their work with Jigsaw, praying that Jigsaw may go from strength to strength as it serves street kids and families in slums and squatter areas in the love of Christ. In August 2015 we were delighted that Lendehl Sallideo, the Filipino Director of Jigsaw, was able to visit Thirsk and Sowerby. Invited to UK by the Archbishop of Canterbury with a group from the Philippines, he stayed on in order to visit some Jigsaw supporting churches including St Oswald’s. After his arrival a small group were invited to meet him at a meal hosted by Cecily Rands. He shared in the Saturday morning programme of the Holiday Club – seeing the types of children’s activities used by the team and being a part of the fish and chip lunch and discussion about aspects of the week. In the afternoon, in glorious sunshine, Lendehl was the chief guest and speaker at a garden party at Saddlers Cottage. He was able to speak about the work of Jigsaw as an “insider” – someone who had lived in the slums of Manila – now ordained in the Episcopal Church and committed to the ministry amongst children living in poverty. Generous gifts of those who came enabled us to send £300 to Jigsaw Kids Ministries.